Reading is a vital foundation for all educational achievement. If a child cannot read fluently, they will struggle in all their subjects in school. Good reading does not just mean being able to work out the words on the page. It means being able to understand those words, talk about the ideas in them, and be able to approach a wide range of text types confidently. Nowadays, with so many distractions, it can be harder than ever to encourage children to spend time and effort practising their reading. Yet that is what we must do. Children who read at home for just 10 minutes a day are 13 times more likely to reach the expected level. We all want our children to do the very best they can and eventually leave school well qualified to make choices for their whole lives. What is the reading scheme like? EVERY child is involved, from the youngest to the oldest. The scheme consists of 20 levels, each divided into 5 boxes. These replace the old books bands. 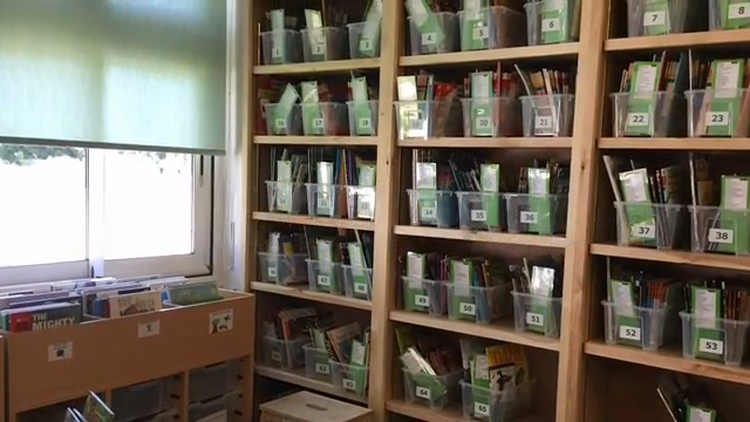 In each box there are 10-15 books to read – that’s a lot of books! The boxes build up progressively in difficulty and contain a range of text types, so there is always challenge. Your child works through the boxes, and staff carefully record what they have read and how they are doing. Who will change your child’s book? Only school staff change scheme reading books, because they are trained to know what each child needs next to develop their reading. What does your child bring home? Record the reading your child has done in the yellow reading record. How can you help with reading? Get into a good routine with reading. Try to do it at the same time each day, so your child expects it. Make it clear this is important time. Turn off distractions such as the television and tablets. Make time to talk to your child about what they are reading. Book Trust Website This website has lots of ideas to help you to support your child with their reading.